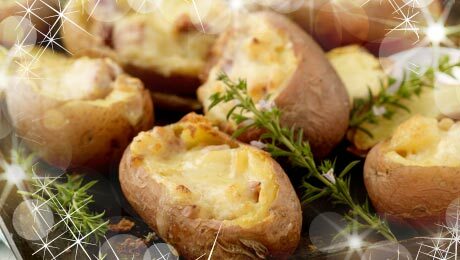 These hearty potatoes are fully loaded and a great way to use up any leftovers from Christmas. Scrub the potatoes and pierce with a fork. Bake at 180°C/350°F/Gas Mark 4 for 1 hour or until tender. When the potatoes are cool enough to handle, cut a thin slice off the top of each potato and discard. Scoop out the pulp, leaving a thin shell. In a large pan, over a moderate heat, sauté the ham and onion in oil until the onion is soft. In a large bowl, mash the pulp with crème fraîche, salt and pepper. Stir in the ham mixture, cheddar and Parmesan. Place on a baking sheet and bake, uncovered, at 180°C/350°F/Gas Mark 4 for 25-30 minutes, until heated through.